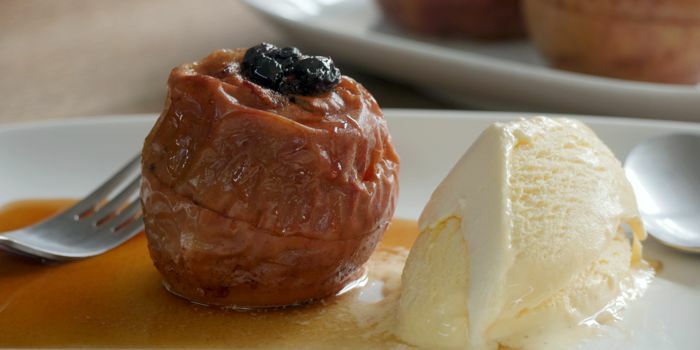 Baked apples are seriously delicious and very easy to make. There is a variant known as an apple dumpling, which is the same thing wrapped in pastry. You can use any kind of eating apple you like. I don't recomment cooking apples because they will turn to mush. You need to soak the dried fruit for an hour or two in orange juice or rum. Use enough liquid to cover them with about 1cm (half an inch) extra. When you're ready to start, wash your apples and remove the cores. If they won't stand up straight cut a sliver off the bottom so they do. Cut a line through the apple's skin around its equator. Squirt the inside of the cores with lemon juice to stop the apple going brown, and stand them in an ovenproof dish. Drain any excess liquid off the sultanas, sprinkle with cinnamon and nutmeg, and stir together with enough golden syrup to make everything stick together. If your kitchen is too cold for the syrup to flow easily, stand it in hot water for a few minutes to soften it. Spoon filling mixture into the core of each apple. Pour a little apple juice into the bottom of your dish. Preheat your oven to 160° C (320° F) fan/convection, 180° C (356° F) conventional, gas 4. Bake for 45 minutes. Serve with ice cream or custard. The video above is from the Keef Cooks YouTube channel. Click here to see the video recipe of Baked Apple with Sultanas on YouTube. Orange juice or rum to soak the fruit in. A squirt of lemon juice. Prep time: 10 minutes. Soaking time: 2 hours. Total time: 2 hours 55 minutes. These ingredients aren't free y'know!